Millennials are outspending their older peers at restaurants, new credit card spending data from Bank of America Merrill Lynch shows. 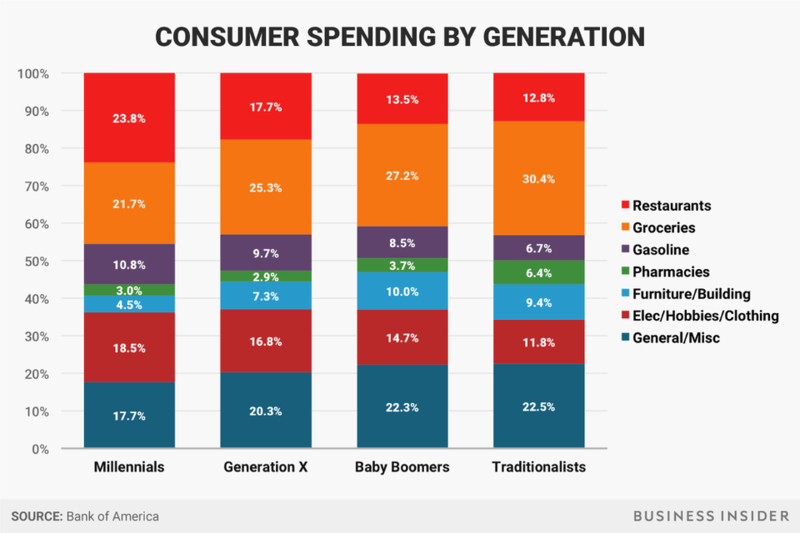 The data, collected over the 12 months ending in June, also shows that millennials are spending more of their income on electronics/hobbies/clothing stores than older generations. While millennials are spending the most on gasoline — 10.8% of their budgets — the bank notes that spending on fuel has declined for five consecutive months. Much of this extra disposable income has been going to restaurants. “Our analysis shows that restaurants tend to benefit the most from declining gasoline prices,” Bank of America said. 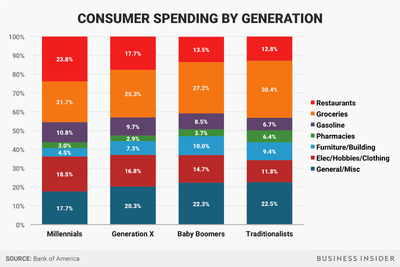 Not surprisingly, older generations are vastly outspending Millennials at pharmacies. Older people do tend to take more prescriptions medications, after all. They also spend more on furniture and building material than Millennials, who are less likely to own their own home. Millennials — which are now the largest demographic group — have come under fire for their spending habits recently. An Australian real-estate mogul hit the headlines earlier this year when he suggested millennials aren’t able to buy homes because they’re eating out too often.